I have, in what feels like a harmless way, been enjoying observing passively my wife’s dauntless efforts to learn French, conversational French, on her own, using various brands of the most popular form of self-education tools that exist. I mean, of course, computer-based apps, for smart devices and computers. They seem mainly to work on the principle of going blah blah blah at you in the language with which you are challenging yourself, and you go blah blah blah back, repeatedly. There are exercises, with recursive quizzes built-in to assess progress, wherein variously you listen to a native speaker (they all claim native speakers, and eavesdropping, sometimes I wonder; I’m not a native speaker so I keep my mouth shut… usually; let’s just say maybe some of them are, like, natives of the docks in the old port of Marseille) and try to decipher what they’ve said, or you try to repeat it, phoneme for phoneme. Your mastery is measured in various ways, and there is regular, if not altogether constant feedback. You accumulate points, or other rewards, receive praise, and are gently corrected. This is the fundamental paradigm of most of these apps as far as I can tell, regardless of whether they charge you, and most of them try to get you to “subscribe” at some point one way or another. Surprisingly some very good software for picking up the rudiments are completely free – after which, frankly, I would move on to a more efficacious methodology even if it costs a few coins in the currency of your chosen tongue. There was for me the added circumstantial impediment of my having only one aunt, a widow, at best semi-literate, who was, except for the marriage of my father to my mother, not related to my only uncle, a life-long bachelor. Further, given the proclivities, life style, and stated preferences, not to mention a highly introverted nature, of my uncle, I knew it was impossible, should he ever have indulged himself by joining the holy state of matrimony with a literate woman, he nevertheless would never have countenanced his soul mate poking around his stuff, never mind violating the sanctity of his personal desk, which presumably, further, would likely have been in a room, which he would have kept locked, dedicated to the purposes to which one puts a personal desk. And who used fountain pens any more in that day and age anyway? Similar antinomies still occur even in the most up-to-date software products it seems. Developers clearly are facing the same struggle to come up with not only credible dialog that is not merely authentic and idiomatic, but similar to real quotidian discourse that might actually occur between real people who find themselves in real situations doing, let’s face it, essentially ordinary things. One of the first revelations of learning a language sufficiently to comprehend most of what’s said within earshot when you happen to be, let’s say, sitting in a café in the south of France next to a married couple from the next town over on what happens to be market day is that, not to put too fine an edge on it, they’re not talking about Proust. Or Mallarmé. They’re not discussing the finer points of Sartre’s thoughts on Nothingness. They’re not amusing themselves exchanging bon mots by way of noting the advances that feminism has made in La Belle France since the days of de Beauvoir. They’re saying the same inconsequential, mundane, homely, and sometimes largely inarticulate things we all do in what passes for conversation about our basically contained, safe lives as we comport ourselves in the unremarkable enclaves of our quotidian wherever we happen to live, and whatever we happen to utter when addressing our intimates. An additional deficit to these language learning software apps, from my perspective, is, as well, that there’s not much effort given to giving a clear sense except by inference and that blasted continuous repetition of phrases in that stilted scripted language they’re teaching you – which within the specifics of my particular observation is not French, but near-French, Simu-French – about what the cultural norms may be of the societies within which real French is unself-consciously the, pardon the expression, lingua franca of everyone, from the elite to the hoi polloi. Which is to say, there are some ways in which it’s polite to speak to others, especially mere acquaintances and strangers. And let’s face it, there’s no reason to learn French intensively and immersively for casual reasons (though I know there are some otherwise temperate and good-natured souls who pick up other languages as a hobby, with no prospect of ever actually putting them to active use). Not unless you own property in France which you hope to enjoy on a regular schedule of visitation, or you’re ex-patriating yourself for reasons about which it would be certainly a rude and presumptuous intrusion for me to inquire, or you are marrying into a family of exclusively native French speakers and who, your intuition alone so far has told you, are OK kind of people, maybe even your kind, and you’d like to converse in something other than an impromptu sign language plus an awkward mutual but inadequate command of the limited vocabulary of Franglais we all seem to share, plus a lot of smiling while engaged in eye contact of the most earnest sort. Because Franglais is good, maybe, and mainly, to find yourself a toilet in an emergency and for getting ketchup for your frites. You do want to learn the language so as to reveal some finesse and sensitivity for it, even if your motives are purely touristic however, and intended not only to smoothe your sojourn in a foreign country as a visitor, but to enhance the pleasure of actually being there by having an ability, however limited, to engage with natives in some polite conversation where you might compare views about such matters of universal interest as the weather, or the beauty of the countryside, or the tender yet toothsome je ne sais quoi of the volaille forestiére (chicken breast, hunter style) you ordered with such aplomb and confidence. In short, there are few people insensitive enough or so supremely self-possessed as not to care if they come across as a dork or, worse (though sometimes the sadly stereotypically expected behavior of an American in virtually any EU member country), as an exuberant kind of gorilla with a talent for what resembles the power of intelligible speech. These thoughts occurred to me today, as I happened to be musing on this on my daily commute to the local bakery, in the context of trying to come up with ways to encourage my wife in her thoroughly successful efforts so far in learning a language using such sometimes tragically impaired tools. Her efforts are heroic and deserve not just encouragement but assistance of a kind based more solidly in the real world of the France and its people with which we have become familiar in an affectionate way through our regular visits. What I thought, as I encountered, among other things, some of the usual sights along the way, and had to deal on the road with some of the usual impediments one encounters on the highways and byways of rural Provence, was how much deeper would be the experience of gaining mastery of conversational French if it addressed some typical sitations with what someone might actually wish to say to the individuals one encounters randomly, if not serendpitously on such rounds. So, here are some phrases I came up with, just this morning, that I’d like the neophyte speaker of basic French to tackle. And let them decide how much more fulfilling it is to be challenged by these phrases. In rural France (indeed, in the whole country), even the tiniest villages and hamlets turn summer into a music festival. Our little village features, among other genres, jazz. We’re lucky to have some enthusiastic performers, some of them very accomplished amateurs, others professional musicians now semi-retired, as are so many of the local inhabitants. This past year, timing being everything, we were able to catch at least one show. 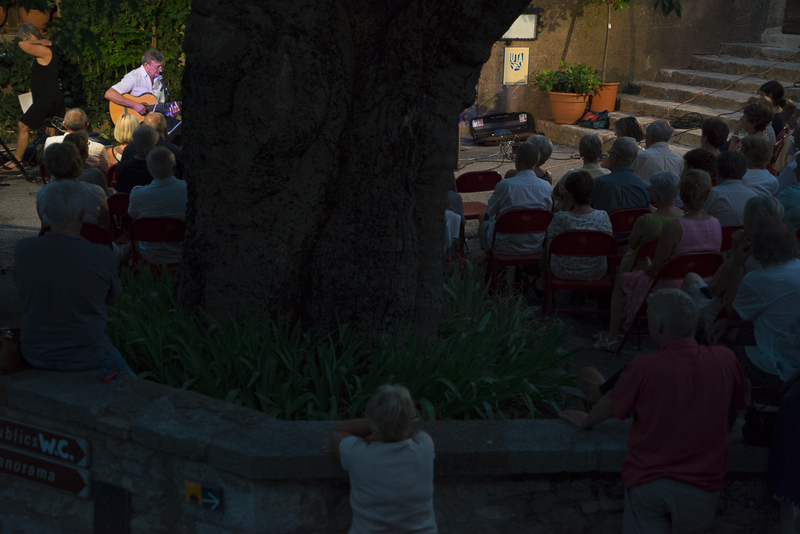 The favorite venue, in the courtyard in front of the 13th chapel fills with folding chairs that are gathered around the 600 year-old micocoulier. It just so happens that courtyard sits directly in front of our little house overlooking the village center. So we would always have ringside seats, schedule permitting. I decided to haul out some fancy kit I have, essentially a state-of-the-art recording studio, complete with high resolution microphones, meters, etc. that fit into a case that looks like a shaving kit.